A color combo that I am absolutely loving right now is blush and grey! It's such a feminine combination, and is perfect for the upcoming holiday! This Wishing for Spring Dress really hit the nail on the head with it's name! 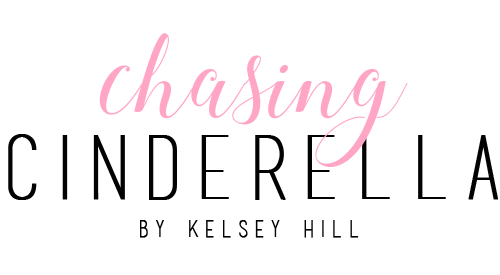 The color is really getting me in the mood for spring (not to mention the beautiful weather we've been having here in Charleston), and the material is perfect for transitioning seasons! Since it's still cold in a lot of places, I paired this dress with over-the-knee boots, but it would look just as cute with a pair of booteis or heels! Valentine's Day is right around the corner! Are you finished your shopping? If not, don't worry! I've rounded up gifts for everyone on your list! See full post here! 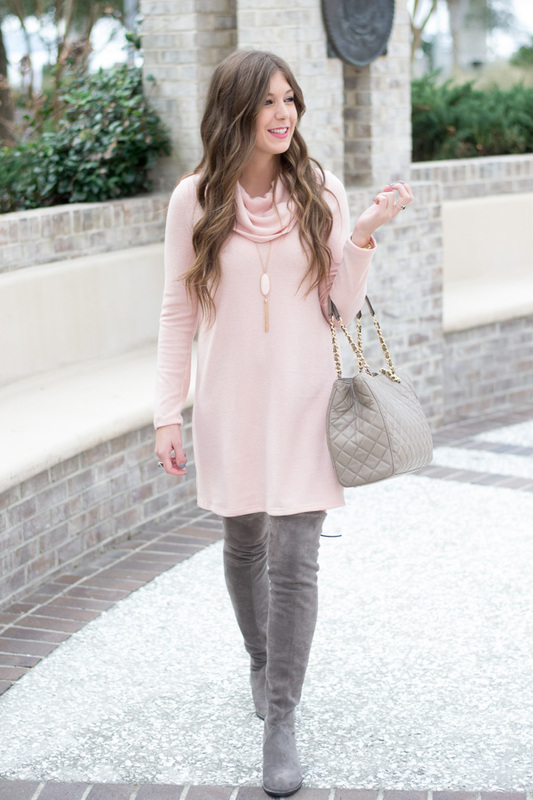 Blush looks so pretty on you and I love those boots! So cute, Kelsey! Love that blush on you! And need those boots in my life so badly! This outfit looks so pretty on you! I love this color combo and plan on using it for the decor in my next apartment. I love those boots too! I love blush pink!! One of my very favorite colors!! And this color combo is so pretty!! Love the blush with the grey! That dress is so cute! Adorable look, Kelsey! I especially love those boots! Those boots are fantastic, and the gray looks so perfect with blush!! Of course, that KS necklace is the best! I absolutely love your boots, they are so cute! That outfit goes so well together, I really want that dress! Yea! Pink and grey is so in right now, totally loving this! I am seriously in love with this outfit. So beautiful! Love this color combo and your gorgeous dress! So pretty lady. What a beautiful color combo! I love those gray boots! Completely obsessed with this color combination! You look absolutely gorgeous! I'm loving that dress, especially the beautiful baby blue color it also comes in. So perfect for spring!! how gorgeous are your boots!!! 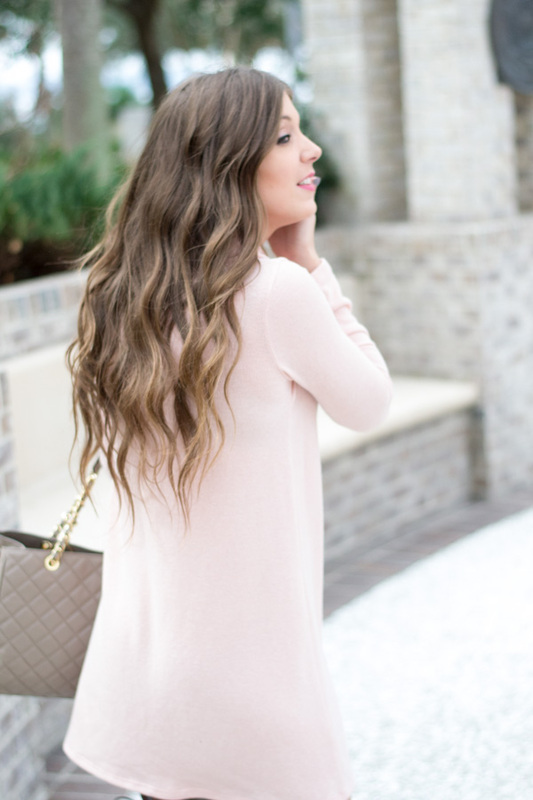 Loving this blush colored look so much! Those OTK boots go perfectly with it! This color combo is perfect. I love those boots. Stunning! I love light pink and grey together, your entire ensemble: your hair and your makeup is very subtle and natural too. wow, I really love this outfit. like LOVE! what a great look! This dress is so cute on you! Love that color! The combination of the boots and the dress is absolutely breathtaking! You have a keen eye in styling. You look STUNNING! I love the blush & grey combo! Seriously I absolutely love this color combination!! You look fantastic!! I am in love with those boots! I am wishing spring big time today lo. these colors look awesome on you. Loving this blush color! You look so pretty in this color combination! Love that dress on you! 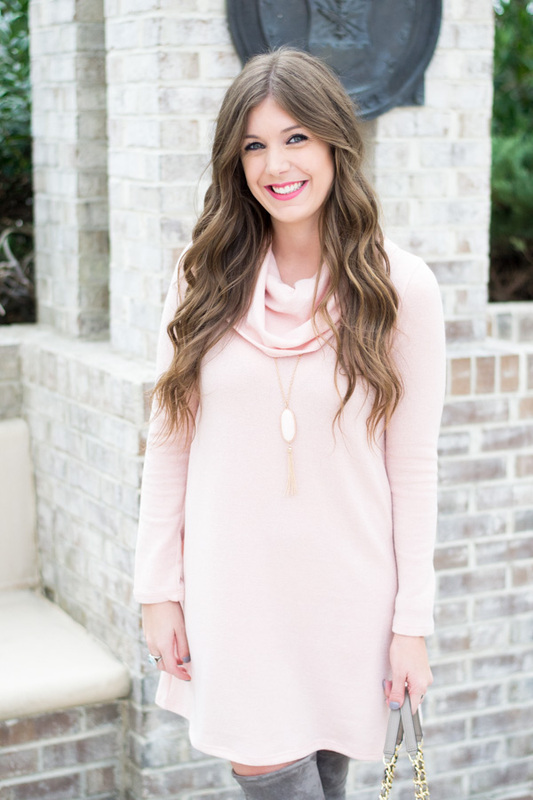 Love this cowl neck sweater dress and blush with grey is the best combo! You look absolutely amazing in this blush dress. Love those boots that you paired with it too!! 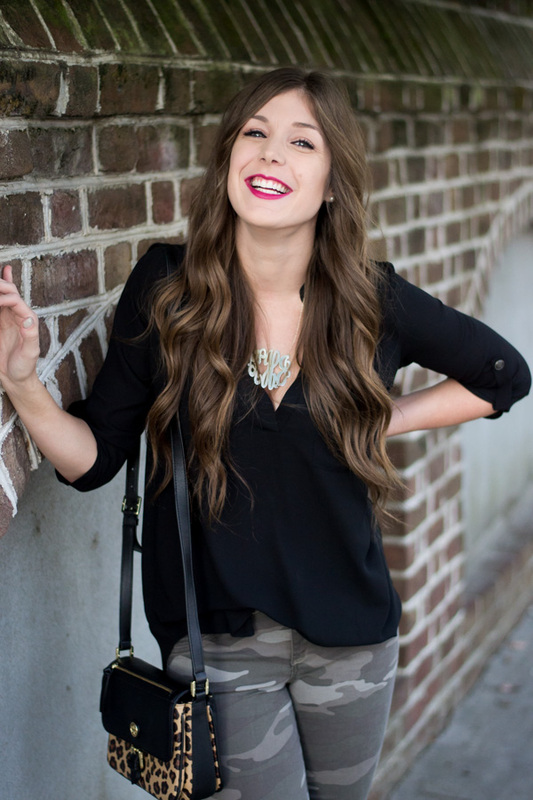 This color combo has always been one of my very favorites - and this outfit is no exception! I adore that dress on you, and the boots are gorgeous too - plus your accessories are stunning! Also, can I just have your perfect hair, please and thanks?! This outfit is perfect. I love the boots! The color combo is gorgeous for February. I love the cowl neck on the dress. I can't get enough of blush lately! Love this whole look. I love this look! Grey and pink is a great combo! I LOVE this color combo! & it looks especially great on you :) I've been dying for a pair of over the knee boots, but I'll probably have to wait until next year to invest. Oh, & your Kendra Scott necklace is adorable! I am in love with that blush pink! Too cute!